Kelly is a natural-born Spirit channel, psychic medium and lightworker based in Singapore. A gifted oracle, she offers face-to-face and online readings with Angel & Tarot cards, as well as animal communication sessions and energy healing services. While Mars plods along in reliable Taurus, messenger planet Mercury swooshes into hot-blooded Aries on Monday, 13 March, and chats up a storm with the Celestial Ram until 31 March. Universal energies encourage spontaneous expression; still, be mindful of what is said from the lips but not meant in the heart, and count to ten before you say something in the heat of the moment that you might regret later. The saying that “he who controls his tongue can rule the world” holds very true for the next couple of weeks! Count to ten before you say something in the heat of the moment that you might regret later. So let’s check out This Week’s Tarot. Here we go! LEFT: NINE OF CUPS REVERSED. Upright, the Nine of Cups is the card of contentment; ill-dignified, expectations have gone unmet and disappointment is the mood du jour. Be careful not to over-indulge in hurt feelings, though: Mars in Taurus + Mercury in Aries could lead to passive-aggressive seething, unfortunate meltdowns and unproductive confrontations. Stressed and/or pissed over developments? Go get a time-out and some fresh air instead. Vent to trusted friends (this card in reverse also suggests loneliness). don’t be a stranger. You are not alone. MIDDLE: SEVEN OF PENTACLES. At the heart of this week’s Tarot is a reminder to be patient and practice self-control – not only in matters of speech, but in situations that require patience, and where you don’t have the final say when it comes to timing. The Seven of Pentacles indicates that if you’ve done what you can, given the circumstances you’re in, great – now let it go and live. No matter how you’re feeling now, life goes on, and Karma is a Law. The efforts you make now will bear a harvest in the fullness of time. No matter how you’re feeling now, life goes on, and Karma is a Law. The efforts you make now will bear a harvest in the fullness of time. RIGHT: THREE OF SWORDS REVERSED. I’ve always found the Three of Swords to be a card whose bark is worse than its bite. A bleeding heart impaled by three blades seems like a terrible harbinger of heartbreak, but this card vibrates to the number three, the energies of which are dynamic but also somewhat fragile. 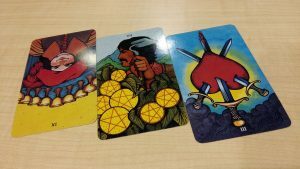 In other words: the Three of Swords, especially when reversed, indicates that the heartache or disappointment you experience can be alleviated, and without too much difficulty. Don’t discount your emotions – what you feel is real – but the key to dealing with disappointment is patience, timing, and self-restraint. The key to dealing with disappointment is patience, timing, and self-restraint. Some stress coming up this week but hang in there. And remember, with Mercury in Aries, sticks and stones blah de blah, but words can never hurt you permanently – if you take the right actions to release negativity, protect your Self, and maintain your sacred space.